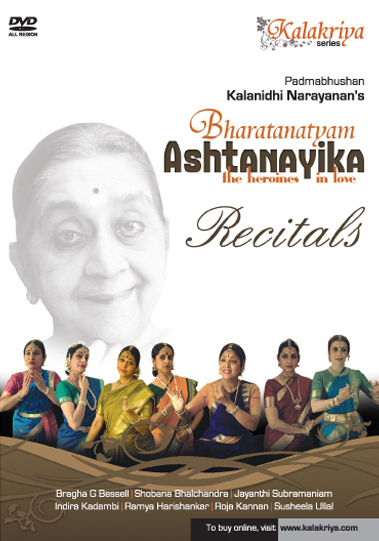 This DVD brings eight scintillating presentations of ‘Ashtanayika’, the heroines classified by ancient Bharatanatyam texts in accordance with the way they respond to love. Here a clutch of the best dancers of our times trained by ‘Padmabhushan’ Kalanidhi Naryanan (‘Maami’, to her students) explores the torment and turbulence experienced by these lovelorn women aided by padams and javalis composed by India’s celebrated composers. It is a classy and subtle exposition of ‘Shrungara’ that deftly steers clear of crassly depiction of a sensitive emotion.